I really couldn’t start a website about Lurchers without including this lady. 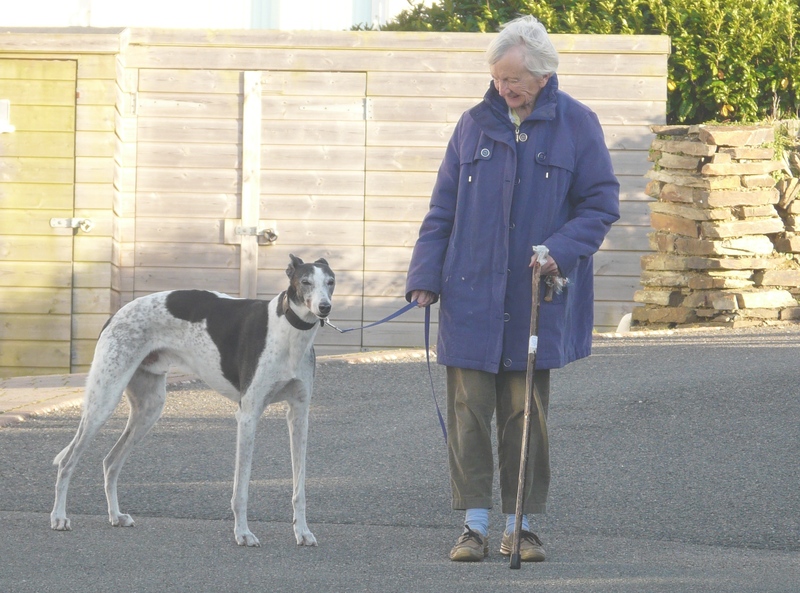 Mrs Winifred May has been rescuing Greyhounds and Lurchers since her twenties. And I hope she will forgive me for telling you that when this picture was taken, last year, she was eighty five years old. I might be in the dog house for using the picture as well. How do I know about her? She’s my auntie, my mothers younger sister, and she’s had dogs for as long as I’ve known her. Often her and her late husband Len had more than one “long dog” at a time sometimes as many as three roaming the house. Over the years she has experienced and learnt so much about the dogs that she loves and it is her knowledge and enthusiasm that helps me to write this blog. So how could I not introduce her early on. 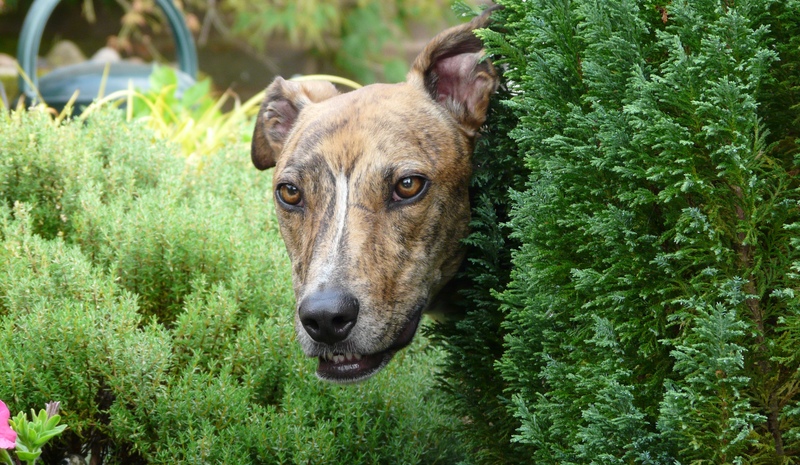 How did she get involved with Lurchers and Greyhounds? Well, as with many things in this life, it was an accident. Where Wyn lived there was a lot of talk going on about a Lurcher that was living wild down by the railway lines and living by catching rabbits on the embankment. It was rumored that it had been left behind when some travelers had moved on from the area. Not only was it having a go at rabbits but several local cats had only just escaped by the skin of their teeth. Wyn’s husband Len set out to catch the villain but it wasn’t easy. I should add that he was one of those people who would not stop once he started something. Trying to get the dog to come to him using tempting bits of meat failed and this was soon abandoned although Len continued to feed the dog daily. It was a home made trap that finally proved to be the dogs undoing. with meat placed under a crate which was propped up by a stick patience prevailed. The bony, starving Lurcher couldn’t resist going under the crate for a bit of grub. The string, attached to the stick holding up one end of the crate, was pulled and the Lurcher fell for the oldest trick in the book. The dog was then taken to Wyn’s house and fed and cared for. 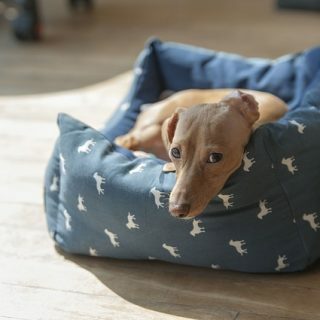 It sounds like a happy ever after story, but, the dog escaped many times and got up to monumental amounts of mischief before it settled down to a more domestic life. I could probably write a book about it and one day, with my Auntie Wyn’s permission I might. After Long Dog number one came many others some one at a time and some in two’s with her having up to three at once. 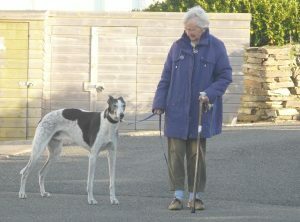 Most of the Greyhounds were rescue dogs from the nearby Belle Vue race track. These had often sustained injury or were simply too old to race and retired into her care. Her last dog Jake ( shown in the picture) was a racing Greyhound who found the view of the race from the trap much better than that obtained by running round it. He simply refused to go and hence landed himself a life of care and luxury retired almost before he’d started. I often think about how much Wyn has given to all these animals over the years but I have also to remember what they gave in return. Every day for year after year she has walked her dogs, in all weathers and when I went out with her and the greyhound in the picture I struggled to keep up with her. She’s as fit as a flee and I think that anyone who needs to get fitter could do no better than take on a Lurcher as personal trainer. All that and loving devotion as well. 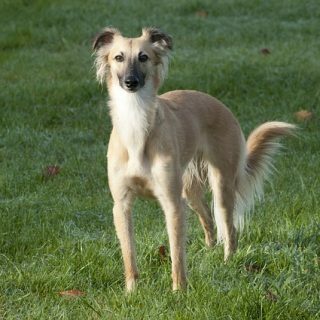 OK I’ll stop trying to sell the idea of adopting a Lurcher and if you already have one you’ll know exactly what I’m talking about. I have no doubt that I will write more about this wonderful woman in the future.